An Equity Analyst job responsibilities include stock monitoring, rendering financial expertise for investment to make a profit, provide various analyses on portfolios of managers, data security, data interpretation and aiding for the investment process. A professional Equity analyst analyses the trade, stock exchange of the company and makes the investment plans thereupon. The role of an Equity Analyst fits well into various facets like – charitable endowments, financial organizations, research firms, investment companies, brokerage firms, MNC and so on. 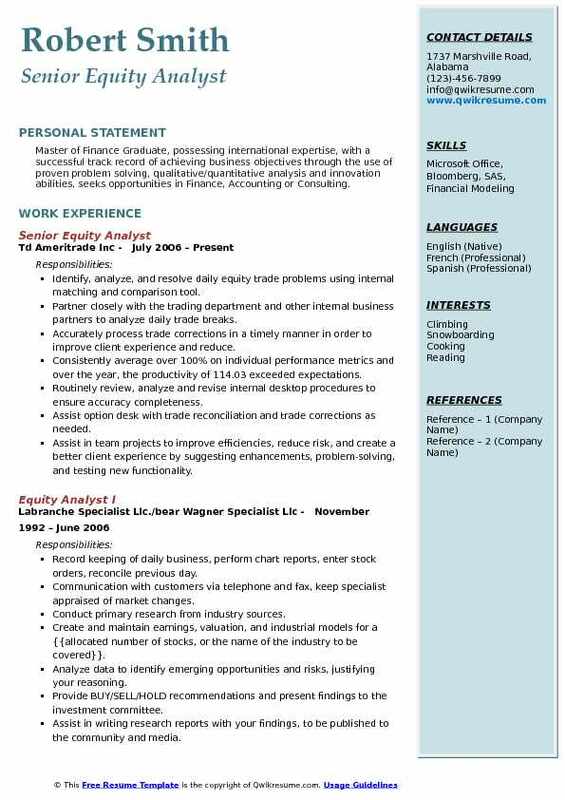 An Equity Analyst Resume sample that depicts a wide range of responsibilities will be the most sought out resume while a hiring company looks out for a professional Equity Analyst position. To pursue a career as an equity analyst, a candidate should possess a bachelor’s degree in Economics, Mathematics, international finance, financial management or Finance. Most of the companies, however, look out for a Masters Degree in Business Administration with some practical experience. Summary : Skilled financial professional with years of experience in banking, accounting. Capabilities include Financial Statement Analysis, Equity & Project Valuation, Financial Modeling, Advanced Excel knowledge, Advanced Access knowledge, Bloomberg Product certification, Executive level presentation skills. Successfully research, analyze, and maintain the company financials departments largest equity portfolio in accordance with the united states GAAP and IFRS accounting standards. Created and implemented North America's shares outstanding update workflow and quality control process. Manage a team of equity analysts that collect and analyze historical market capitalization data. Collaborate with Bloomberg news to develop articles and showcase Bloomberg's world-class data sets. Conduct earnings estimate consensus analysis by sourcing and qualifying broker reports within strict deadlines. 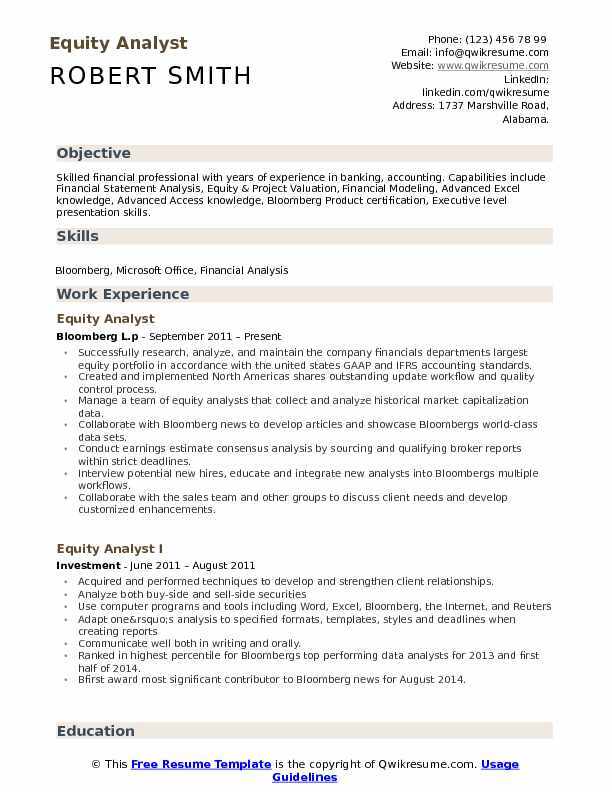 Interview potential new hires, educate and integrate new analysts into Bloomberg's multiple workflows. Collaborate with the sales team and other groups to discuss client needs and develop customized enhancements. Manage all North American data analysts daily client interactions through the Bloomberg help desk. Effectively conduct client calls with Bloomberg's most challenging clients to understand their frustrations, manage their expectations and develop comprehensive solutions. 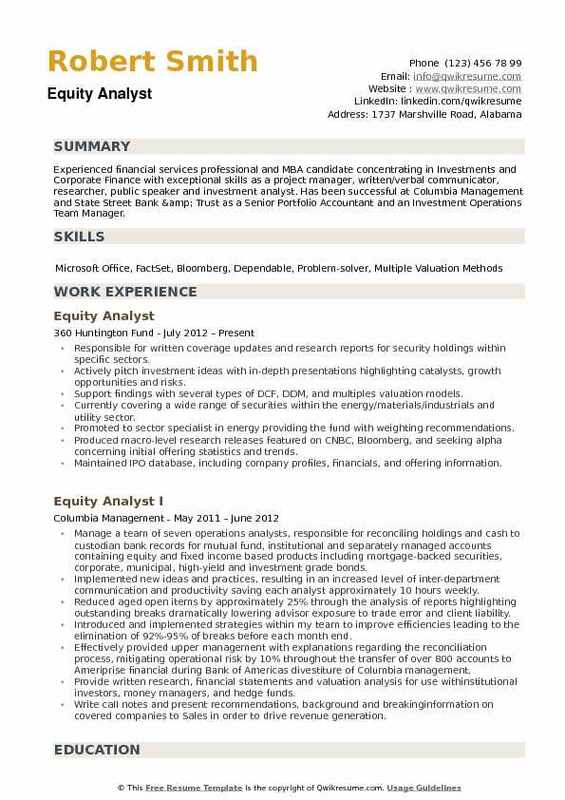 Summary : Highly self-motivated financial analyst specializing in investment research and quantitative analysis. Superior analytical and interpersonal skills. Trilingual, result-driven, team player with exceptional time management and proven problem-solving ability. Grew the Assets under Management from $35 to $277 million in 4 years of my tenure. The main task as an equity analyst was to initiate and present profitable equity investment ideas directly to the portfolio manager. 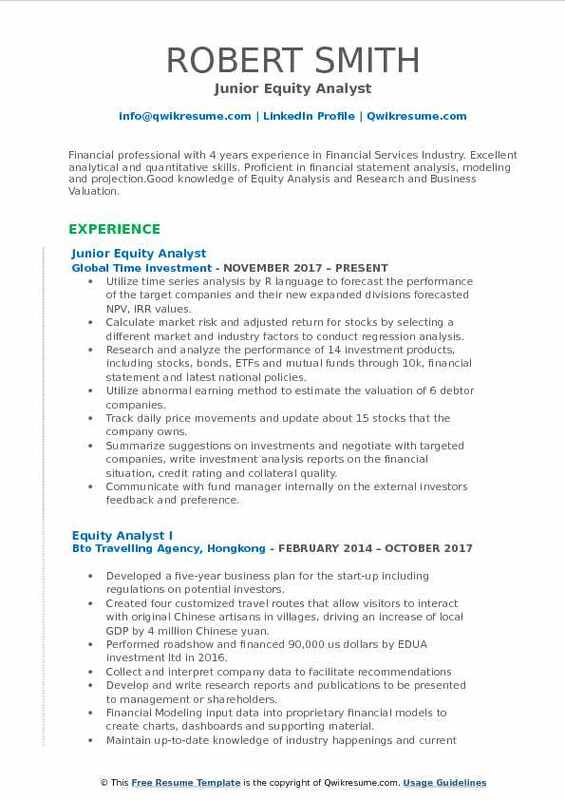 Conducted a generalist, top-down driven fundamental research and analysis, strengths include the ability to accurately identified market opportunities to drive short and long profit/loss performance, identify mispriced assets accurately, monitor institutional inflow and outflows and apply valuation and sensitivity models to forecast and test investment thesis. 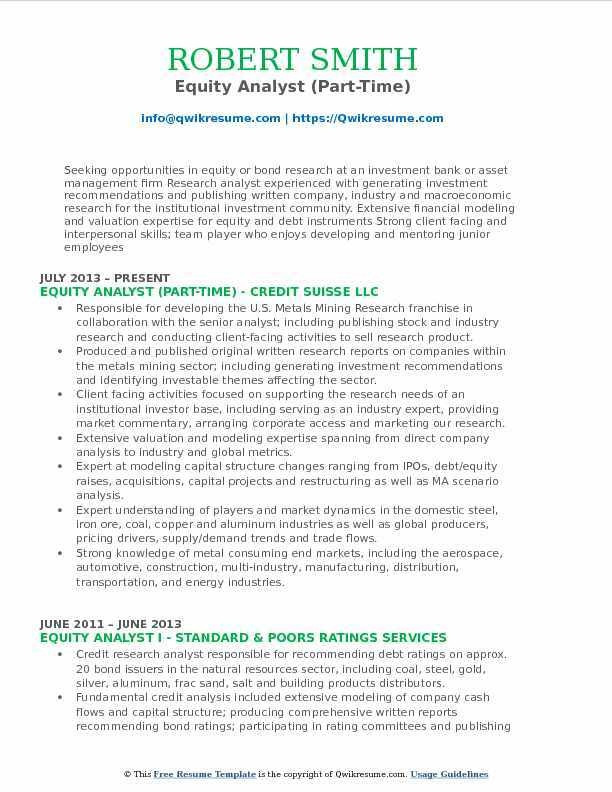 Was the primary research analyst to the portfolio manager and senior analyst. Through my efforts was a major contributor to the 20% plus annual gross returns during my 3 out of 4 years with the firm. Recommendations provided for double-digit returns on many equities, yielding tens of millions of gross profit dollars. Created and expanded the qualitative and quantitative research infrastructure for the firm. Monitored and modeled hundreds of companies to determine proper valuations for entry and exit points. Data gathering from sec filings, press releases, and conference calls, attending conferences and monitoring news flow(s). Handled investor inquiries regarding statements, LPA agreements, subscription agreements, and management fees. Summary : Well rounded financial analyst advising an investment committee on a $150 million investment portfolio utilizing comprehensive fundamental analysis and financial modeling. Advanced skills in enterprise and market valuation based on financial concepts including discounted cash flow and financial statement analysis. Possess a unique understanding of industrial and utility industry concepts. Member of a four-person investment committee responsible for portfolio equity investment decisions. Develop variant valuation opinions based on diverse industry landscapes, regulation changes, and numerous corporate actions. Communicate with c-level management teams to forecast business operations in the development of projected financial statements. Improve and automate discounted cash flow and residual income models to increase valuation modeling efficiency. Proactively recommend changes and refine internal investment process to improve overall investment return. Streamline data mining capability of a proprietary universe using excel pivot tables, v-lookups, and nested formulas. Provide trading, operational accounting, marketing and businesses development support on an ad-hoc basis. Forecast terminal value by modeling assumptions through discounted cash flow simulation. Investigate industry outlooks, economic trends, product segments, competitors, management. 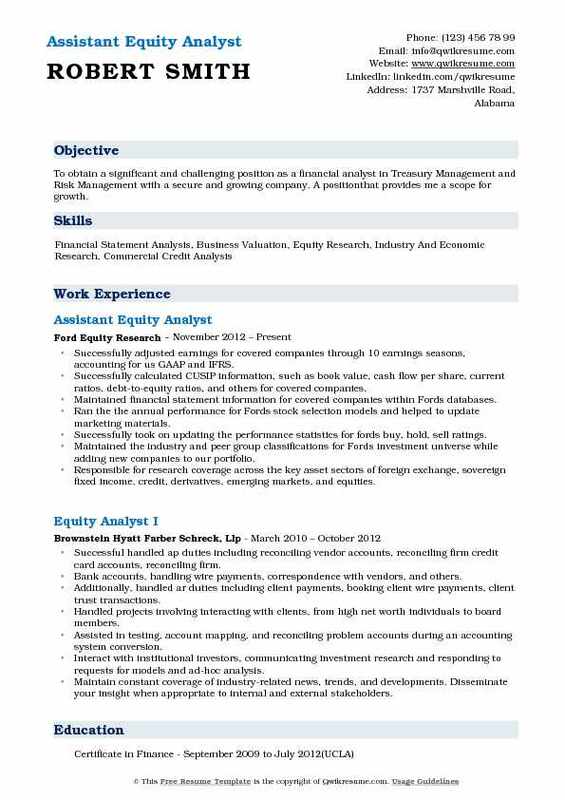 Objective : Financial professional with 4 years experience in Financial Services Industry. Excellent analytical and quantitative skills. 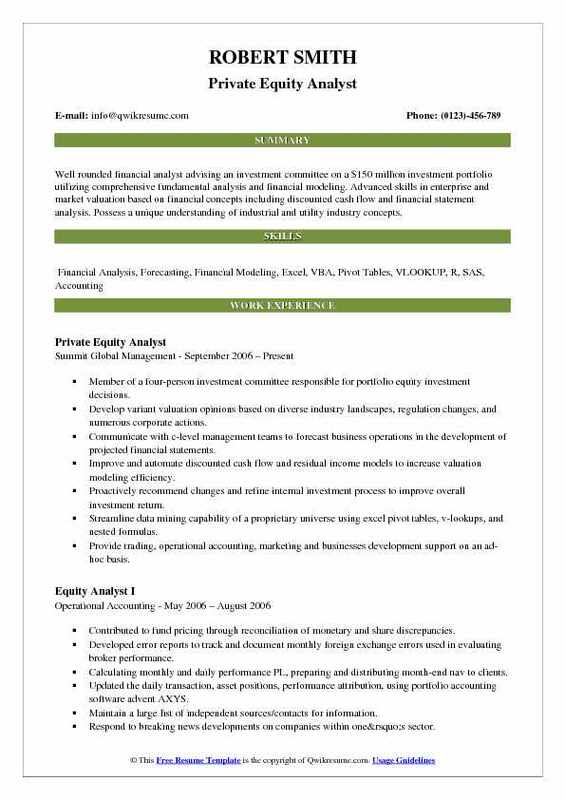 Proficient in financial statement analysis, modeling and projection.Good knowledge of Equity Analysis and Research and Business Valuation. Utilize time series analysis by R language to forecast the performance of the target companies and their new expanded divisions forecasted NPV, IRR values. Calculate market risk and adjusted return for stocks by selecting a different market and industry factors to conduct regression analysis. Research and analyze the performance of 14 investment products, including stocks, bonds, ETFs and mutual funds through 10k, financial statement and latest national policies. Utilize abnormal earning method to estimate the valuation of 6 debtor companies. Track daily price movements and update about 15 stocks that the company owns. Summarize suggestions on investments and negotiate with targeted companies, write investment analysis reports on the financial situation, credit rating and collateral quality. Communicate with fund manager internally on the external investor's feedback and preference. Research real-time market data concentrating on strong performers in the refinance sector. Manage energy and consumer discretionary sectors of a fundamental-analysis-driven investment portfolio. Summary : Master of Finance Graduate, possessing international expertise, with a successful track record of achieving business objectives through the use of proven problem solving, qualitative/quantitative analysis and innovation abilities, seeks opportunities in Finance, Accounting or Consulting. Identify, analyze, and resolve daily equity trade problems using internal matching and comparison tool. Partner closely with the trading department and other internal business partners to analyze daily trade breaks. Accurately process trade corrections in a timely manner in order to improve client experience and reduce. Consistently average over 100% on individual performance metrics and over the year, the productivity of 114.03 exceeded expectations. Routinely review, analyze and revise internal desktop procedures to ensure accuracy completeness. Assist option desk with trade reconciliation and trade corrections as needed. Assist in team projects to improve efficiencies, reduce risk, and create a better client experience by suggesting enhancements, problem-solving, and testing new functionality. Prepared and delivered powerpoint-based presentations in order to educate colleagues working with other industry sectors before conducting group-wide votes on changes in portfolio position. Analyzed current holdings and potential future holdings using discounted cash flow analysis in order to determine share price reasonableness and devise potential buying and selling opportunities. Summary : To obtain a significant and challenging position as a financial analyst in Treasury Management and Risk Management with a secure and growing company. A positionthat provides me a scope for growth. Successfully adjusted earnings for covered companies through 10 earnings seasons, accounting for us GAAP and IFRS. Successfully calculated CUSIP information, such as book value, cash flow per share, current ratios, debt-to-equity ratios, and others for covered companies. Maintained financial statement information for covered companies within Ford's databases. Ran the the annual performance for Ford's stock selection models and helped to update marketing materials. Successfully took on updating the performance statistics for fords buy, hold, sell ratings. Maintained the industry and peer group classifications for Ford's investment universe while adding new companies to our portfolio. Responsible for research coverage across the key asset sectors of foreign exchange, sovereign fixed income, credit, derivatives, emerging markets, and equities. Engaged in writing market commentaries in emerging markets new issue updates. Commentary experience also included IPO fundamentals news and LATAM syndicate loans data at a leading independent provider of real-time financial information. Responsible for developing the U.S. Metals Mining Research franchise in collaboration with the senior analyst; including publishing stock and industry research and conducting client-facing activities to sell research product. Produced and published original written research reports on companies within the metals mining sector; including generating investment recommendations and identifying investable themes affecting the sector. Client facing activities focused on supporting the research needs of an institutional investor base, including serving as an industry expert, providing market commentary, arranging corporate access and marketing our research. Extensive valuation and modeling expertise spanning from direct company analysis to industry and global metrics. Expert at modeling capital structure changes ranging from IPOs, debt/equity raises, acquisitions, capital projects and restructuring as well as MA scenario analysis. Expert understanding of players and market dynamics in the domestic steel, iron ore, coal, copper and aluminum industries as well as global producers, pricing drivers, supply/demand trends and trade flows. Strong knowledge of metal consuming end markets, including the aerospace, automotive, construction, multi-industry, manufacturing, distribution, transportation, and energy industries. A community leader in fostering mentoring junior employees and a core member of the associated forum. Accomplishments include serving as a key catalyst behind department-wide initiatives to formalize associate development process, integrate team franchise objectives, and aligning performance evaluation metrics. 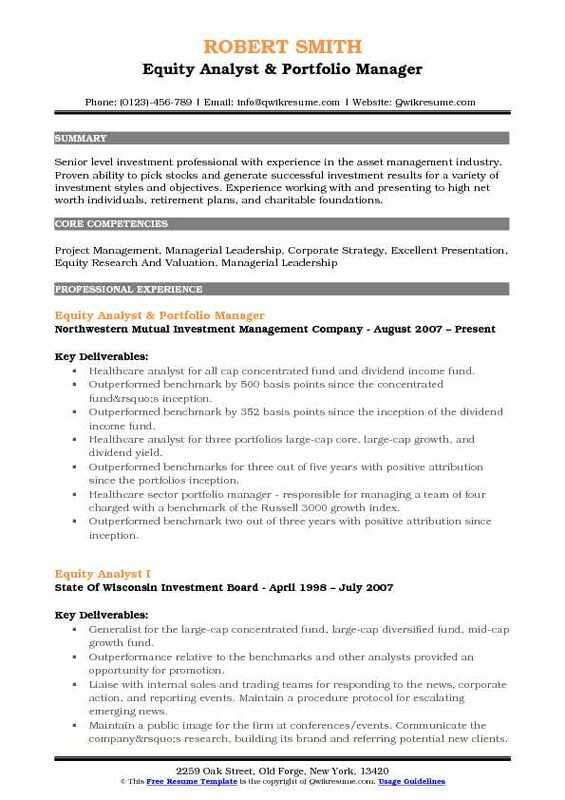 Summary : Senior level investment professional with experience in the asset management industry. Proven ability to pick stocks and generate successful investment results for a variety of investment styles and objectives. Experience working with and presenting to high net worth individuals, retirement plans, and charitable foundations. Healthcare analyst for all cap concentrated fund and dividend income fund. Outperformed benchmark by 500 basis points since the concentrated fund’s inception. Outperformed benchmark by 352 basis points since the inception of the dividend income fund. Healthcare analyst for three portfolios: large-cap core, large-cap growth, and dividend yield. Outperformed benchmarks for three out of five years with positive attribution since the portfolio's inception. Healthcare sector portfolio manager - responsible for managing a team of four charged with a benchmark of the Russell 3000 growth index. Outperformed benchmark two out of three years with positive attribution since inception. Relations departments to identify key credit factors, which resulted in the expansion of the credit analysis. Researching and analyzing companies debt obligations and capital structure while working with an investor. Summary : A results-oriented business leader with a global mindset and a passion to translate strategic plans into action. Proven strengths in strategic planning, project and team management, quantitative research, market strategy, communication, problem-solving, and relationship-building. In-depth Financial Services experience in Investment Management Operations, financial planning and analysis, data collection, competitive intelligence analysis and cross-functional team integration. Successfully researched and pitched stocks to fund and sector managers, adding two securities to the portfolio. Responsible for written coverage updates and recommendations for buy/ sell holdings. Actively pitch investment ideas and identify unique catalysts/ trends through in-depth presentations. Perform fundamental, bottom-up research on small and mid-cap growth stocks. Coverage of companies in materials/industrials/ utility sectors in domestic and foreign markets. Analyzing sell side brokers estimates and building earnings consensus by examining their forecast models and assumptions built in. Examining companies earnings releases to adjust for extraordinary items in order to compare them to sell. Interpreting significant changes in accounting rules for local markets and conveying the analysis to relevant. Analyzing companies financial reports and standardizing the data in order to compare financials and performance metrics on an industry basis. 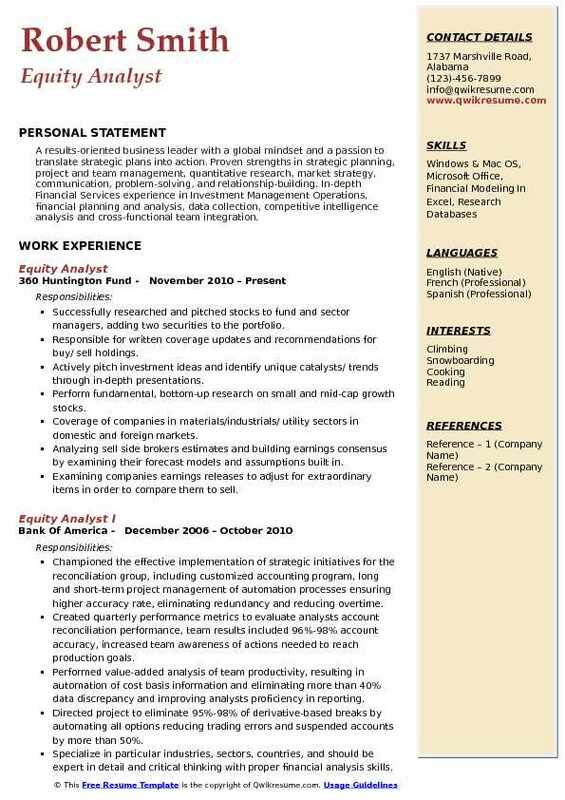 Summary : Experienced financial services professional and MBA candidate concentrating in Investments and Corporate Finance with exceptional skills as a project manager, written/verbal communicator, researcher, public speaker and investment analyst. 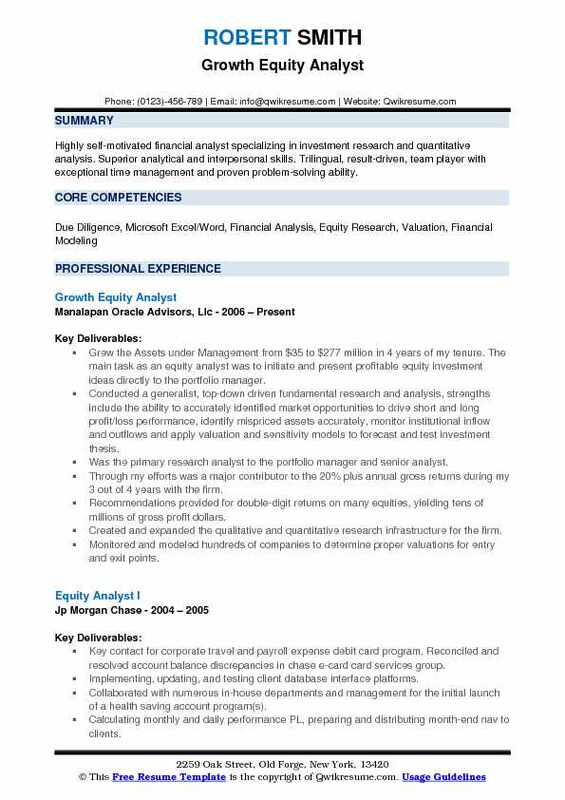 Has been successful at Columbia Management and State Street Bank & Trust as a Senior Portfolio Accountant and an Investment Operations Team Manager. Responsible for written coverage updates and research reports for security holdings within specific sectors. Actively pitch investment ideas with in-depth presentations highlighting catalysts, growth opportunities and risks. Support findings with several types of DCF, DDM, and multiples valuation models. Currently covering a wide range of securities within the energy/materials/industrials and utility sector. Promoted to sector specialist in energy providing the fund with weighting recommendations. Produced macro-level research releases featured on CNBC, Bloomberg, and seeking alpha concerning initial offering statistics and trends. Maintained IPO database, including company profiles, financials, and offering information. Updated and modified valuation models for company research and reporting purposes. Develop investment action plans to improve overall portfolio performance based upon research and meetings with the management teams of portfolio companies.